Ok, I’m a little late to be sharing a 4th of July recipe considering it’s July 7th. Oops. The good new is they are equally as delicious on July 7th as they were on July 4th! I just ate one to do the research for you. Cause that’s the kind of friend I am. 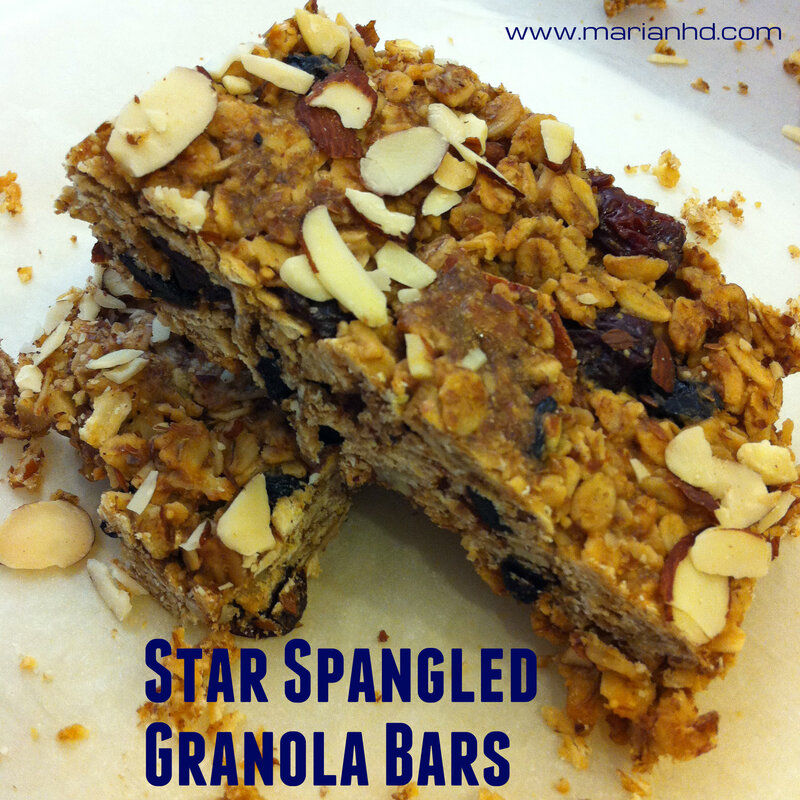 This recipe was created as a spin off from my Easy Non-Cookie Granola Bars that I shared a long time ago. As the post explains, they were an amazing addition to a girls’ weekend. This time around, I needed something to bake and bring to share on our trip up north to visit family. Way back when, when the husband and I were still dating, we would often stay with his younger brother, who shares a house with a roommate. This is no big deal. The only challenge I found was breakfast. The younger brother didn’t always do breakfast. At least, not at an hour I’m accustomed to eating breakfast! I don’t know about you, but I need to eat something before 9am or I get hangry. If you aren’t familiar with the term “hangry,” it describes the situation where one is so hungry he or she becomes irritable or angry at everyone and everything around them potentially preventing them from getting food. After a visit of mornings where I sneakily rummaged through their kitchen for something to eat while everyone else slept, I thought up a better solution. BRING BREAKFAST. It’s that easy. Now I bring some sort of baked breakfast item to share with our hosts so that I feel like a gracious guest and I know there’s something I can nibble on before brunch! Sneaky, I know. But so far, no one has complained about my solution. And since early breakfasts are a rarity with the husband’s family in general, it’s now a standard part of preparing to travel north. Since we were visiting family for the 4th of July, I wanted to get creative and do something sorta themed. I debated between red, white, and blue muffins, or red, white, and blue granola bars. I was a little leery of attempting my vision of fresh strawberries and blueberries in muffins, so I opted to try out the granola bars instead. 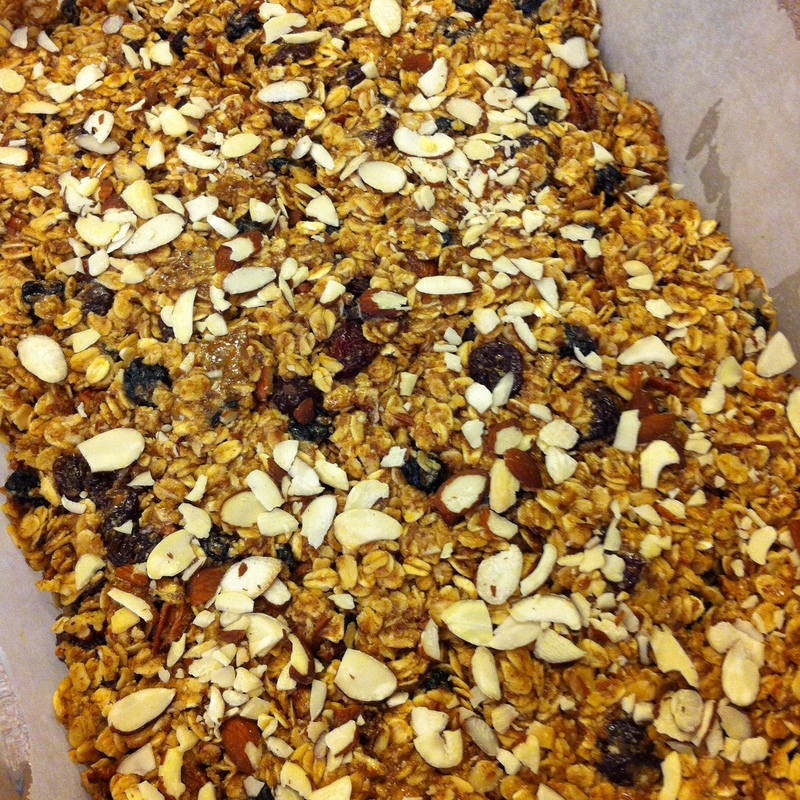 Granola bars obviously call for dried fruit, and that sounded easier. 1. Preheat the oven to 325 degrees. Prepare your 9 x 13 in pan. Brush the pan with walnut oil, line with parchment paper with excess paper hanging over the edges. Brush the paper with oil, too. 2. 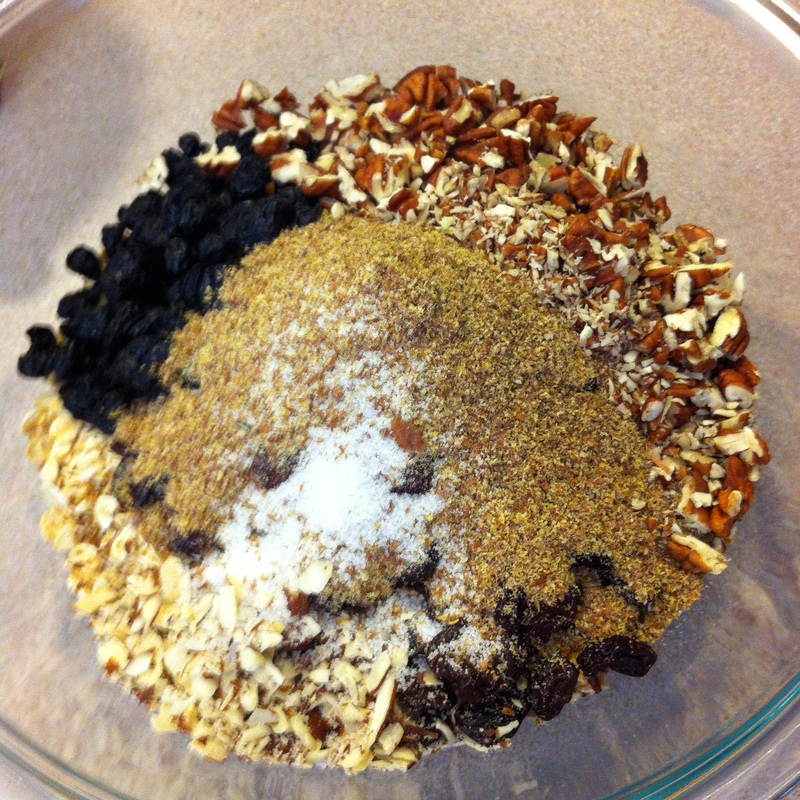 In a bowl, combine oats, cherries, blueberries, flaxseeds, pecans, half of the almonds, and salt. 3. In a small saucepan, combine the honey, peanut butter, 2 tablespoons of walnut oil, and vanilla extract. Heat and stir until everything is melted together. Add to the dry ingredients and stir to combine. Dump the mixture into the prepared pan and press it down evenly. 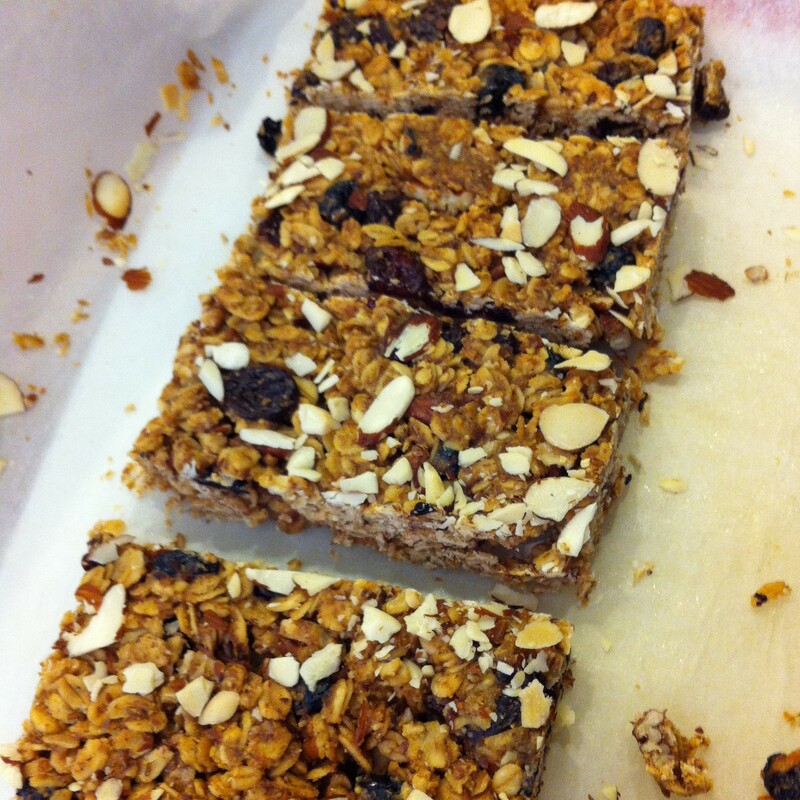 Sprinkle the remaining almonds on top of the granola bars. I used some scraps of parchment paper to make sure I could press extra hard without getting anything stuck to me. 5. Store the bars in an airtight container with parchment paper separating layers. Wrap individually and store in the freezer if you somehow manage to not eat them all immediately. *I found that a large sharp knife worked very well on the edges, and a pizza cutter worked good for the middle of the pan of bars. Experiment with your best cutting tools to get the best result.